Bring out the shutterbug in you! 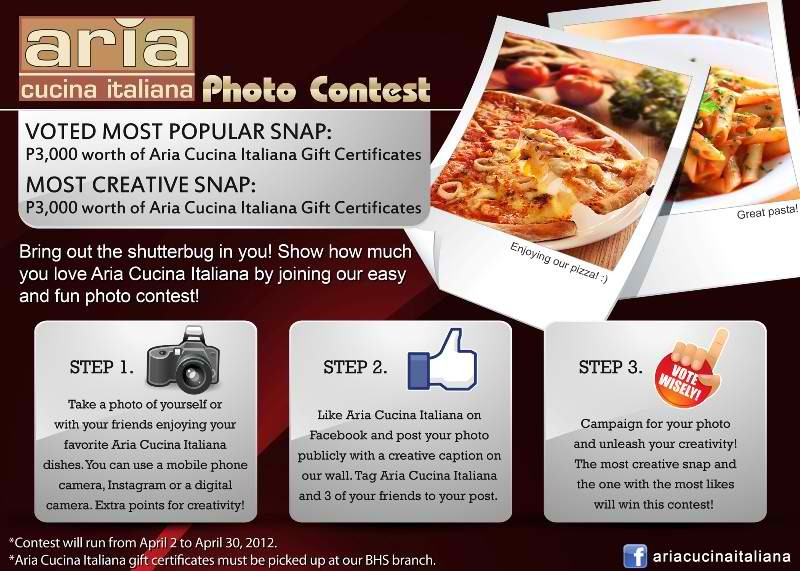 Show how much you love Aria Cucina Italiana by joining our easy and fun photo contest! Step 1 - Take a photo of yourself or with your friends enjoying your favorite Aria Cucina Italiana dishes. You can use a mobile phone camera, Instagram or a digital camera. Extra points for creativity! Step 2 - Like Aria Cucina Italiana on Facebook and post your photo publicly with a creative caption on our wall. Tag Aria Cucina Italiana and 3 of your friends to your post. Step 3 - Campaign for your photo and unleash your creativity! The most creative snap and the one with the most likes will win this contest! *Contest will run until April 30, 2012. *Aria Cucina Italiana gift certificates must be picked up at the BHS branch.